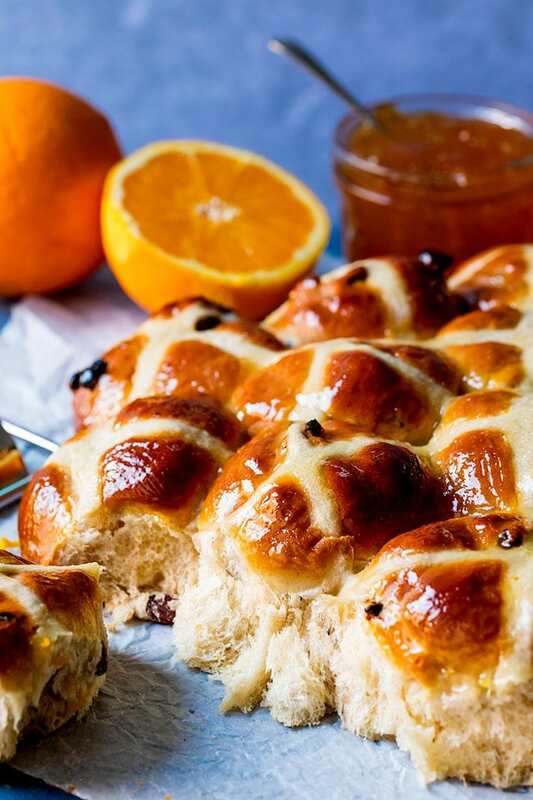 With Easter just around the corner how about making your own hot cross buns with marmalade glaze? Check out my tips for making the softest, fluffiest buns. So soft and fluffy, they make a fantastic Easter breakfast. We had them for breakfast 3 days in a row last week. And also maybe for the occasional afternoon snack and, erm, dessert. I guess they’re just that versatile. Also good for evening snacks, brunch, and the time you’re making a cup of tea and they’re right next to the cups – so a nibble of the corner ends up being a whole one. I LOVE easter baking. I’m not as fussed about making Easter cakes and sweet treats (it almost seems pointless when you can just eat crunchy Easter chocolate straight from the fridge – my favourite), but I’m all about the breakfast/brunch bread treats like these hot cross buns, my chocolate orange version, raspberry and almond-stuffed croissants or these savoury ham and cheese croissants. Total bread fiend over here. 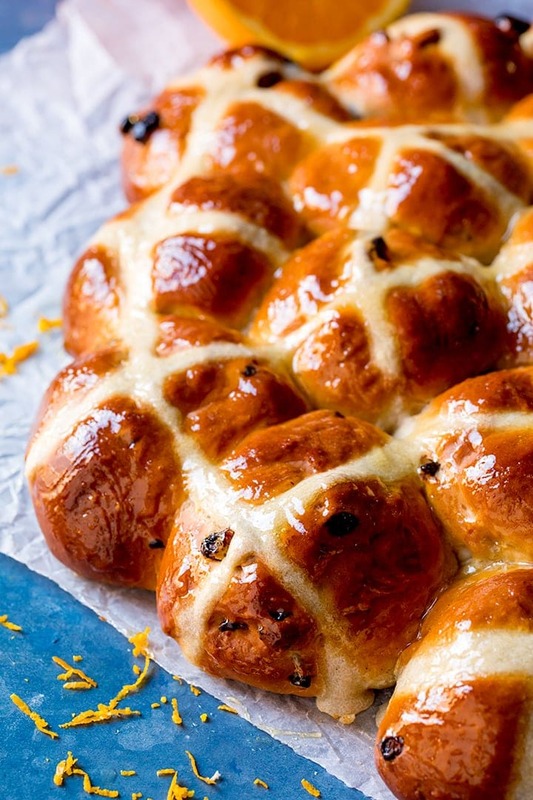 So how do you get the fluffiest hot cross buns? Use bread flour – bread flour (as opposed to plain/all-purpose flour) has more protein – which helps to develop the gluten. It’s the gluten in bread that gives dough that light, fluffy, slightly chewy finish. Heat the milk – milk contains an enzyme called protease that (according to a number of sources) inhibits the gluten formation in the bread. Heating the milk deactivates this particular enzyme. There are arguments that protease has minimal impact on gluten formation, but regardless of this argument, I find the warmer dough from the hot milk creates an ideal environment for the yeast to get to work. Be sure not to pour the hot milk directly on the yeast, as it could kill it. But adding the milk to the flour/salt/sugar/yeast mixture will be fine. Allow two rises. Giving the dough two rises ensures a finer gluten structure with small air bubbles – creating a finer crumb and a softer effect. After the first rise, you need to knead the dough to remove the big air bubbles. But whilst doing this, you’re also removing the air in the smaller bubbles. The second, shorter rise allows the smaller air pockets to develop again, and also further develops the yeasts, giving an improved flavour. Make sure your yeast is in date. Old yeast = flat bread. Even if it’s in date, make sure it’s been stored correctly, especially after opening (usually needs to be stored in a sealed container, away from sunlight. Once opened, it usually needs to be stored sealed in the refrigerator and used within a few months). Yeast sachets are particularly good, as you don’t need to worry about storing containers that have been opened, and one sachet is enough for this recipe. 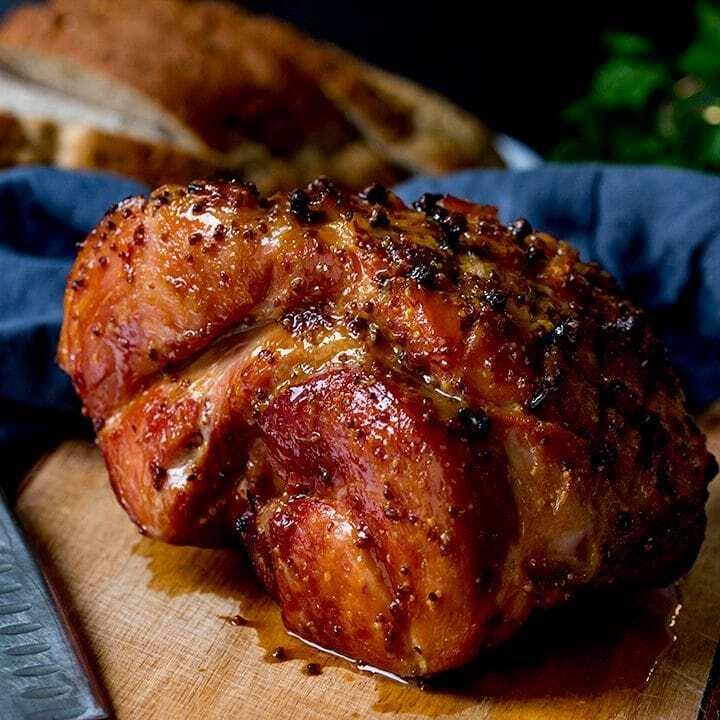 Top with a glaze. Some bread recipes call for melted butter to be brushed on top of the warm bread (before the top of the bread starts to harden). 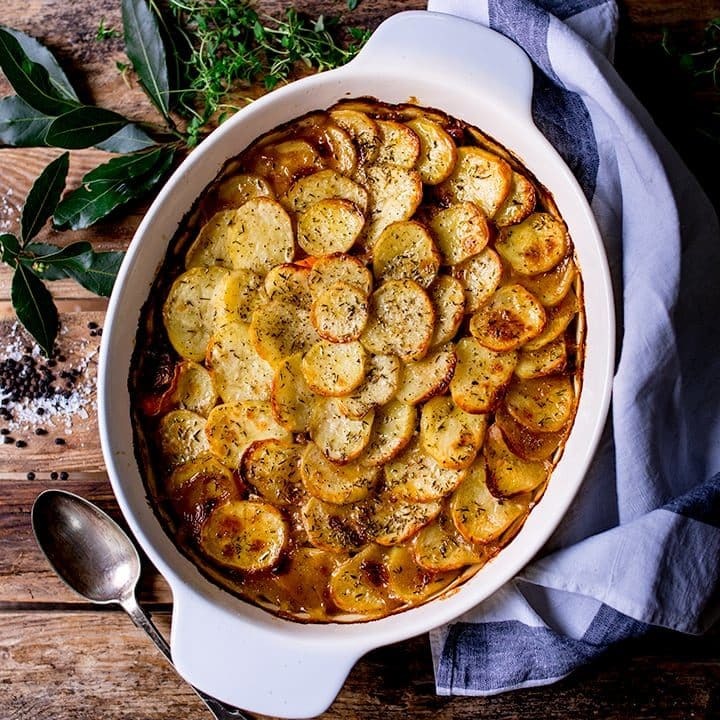 I used warmed marmalade in this recipe. It helps to seal in the moisture and stop the top of the buns getting hard. So lets take a look at the recipe. First we add the flour, sugar, salt and yeast to a bowl. Then add the milk, butter and orange zest to a jug and heat in the microwave (or pan) until hot, but not so hot it would burn you. Add this liquid to the flour mixture (don’t pour directly on the yeast), then give it a mix. Add the egg and mix that in too, then knead for 5-6 minutes using a dough hook or 5-10 minutes by hand. Add in the sultanas and cinnamon, then knead the dough, knocking the air out of it for a couple of minutes. 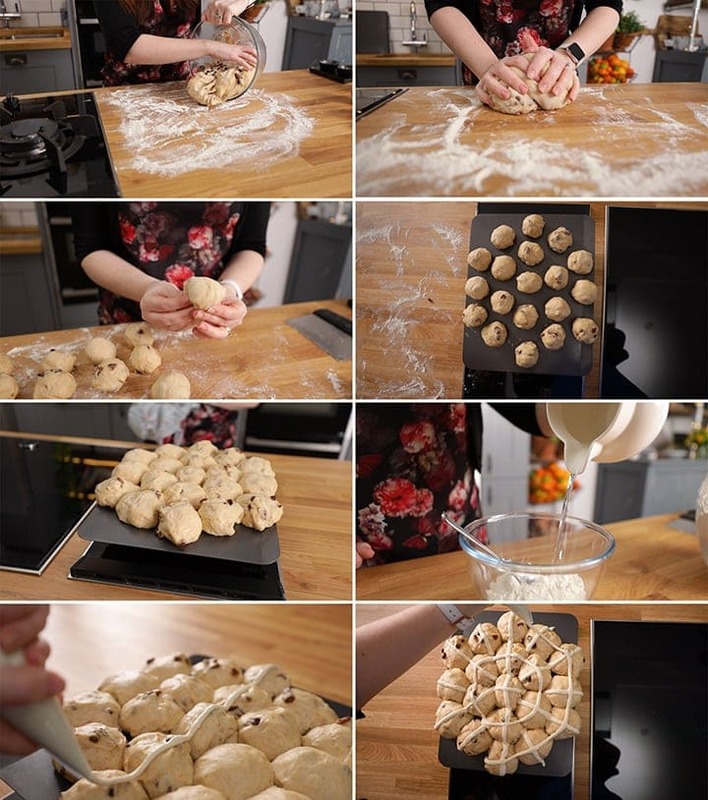 Divide into 19 balls (I weighed the dough and then divided into 19, and weighed each ball – approx 55g each – but you can do it by eye). They will look small – about the size of a ping pong ball. Don’t worry, they’ll expand. Arrange the balls on a lined baking tray, leaving a small gap in between the balls to allow them to expand, and cover the tray with a plastic bag and allow to prove for another hour. Putting the tray in a bag helps keep the warm air in, without letting the buns dry out. Mix together flour and water, then transfer to a piping bag. Snip off the end, and pipe crosses onto each bun. Place in the oven to cook for 20 minutes. Remove from the oven and brush on the warm marmalade whilst the buns are still hot. With Easter only just around the corner! 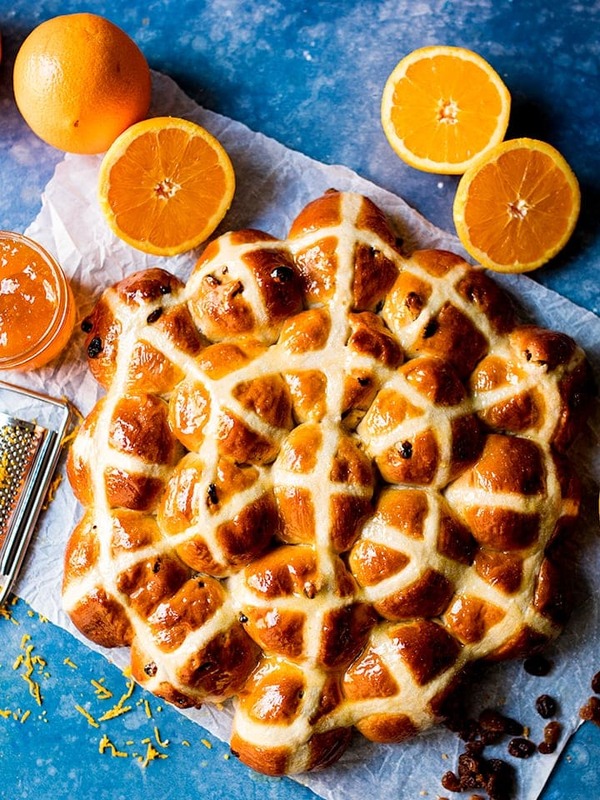 Check out these Hot Cross Buns with Marmalade Glaze. It makes for a great Easter breakfast centrepiece. In the bowl of a stand mixer (or a large bowl) add the flour and sugar, then on one side of the bowl add the salt, and add the yeast to the other side (yeast doesn’t like direct contact with salt). Set aside. In a jug, add the milk, butter and orange zest, and heat in the microwave until the butter has melted and the liquid is hot, but not so hot it would burn you. Add the liquid to the flour mixture, then give it a quick mix using the dough hook, or with a wooden spoon if mixing by hand. Add in the egg, mix again, then knead using the dough hook for 5 minutes. If kneading by hand, knead for 5-10 minutes on an oiled (rather than floured) surface (too much flour will make the buns tough). 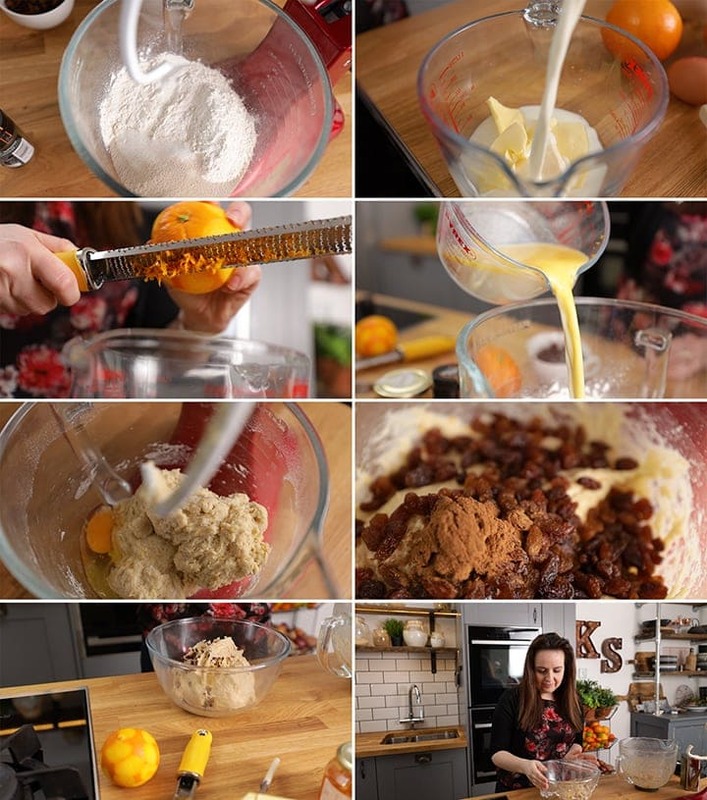 Add the sultanas and sprinkle the cinnamon over the dough and mix for a further minute to distribute through the dough. Gather the dough into a ball and place in a bowl that’s been lightly greased with olive or vegetable oil. Cover with clingfilm and leave to prove in a warm room for an 1-2 hours - until doubled in size. Divide the dough into 19 equal (ish) pieces. You can do this by eye, or you can weigh the dough and divide by 19 - weighing each piece and adjusting as you cut it (mine where 55g each). Shape each piece into a ball and arrange on a tray that's been covered with a piece of baking parchment. I arranged it so there was a vertical line of 5 down the middle, then a vertical line of 4 either side, then finally a vertical line of 3 on the outsides. This makes two rough circles surrounding the centre bun. Arrange the balls so they're about a centimeter apart (They'll start to join up with the final prove and also during baking). Place the baking try inside a carrier bag and leave to prove for one final hour. Preheat the oven to 200C/400F and make up the paste for the crosses. In a bowl, mix the flour with about 5 tbsps of cold water using a fork. You're looking for paste about the consistency of wallpaper paste, so may need to add a bit more flour or water. Spoon the paste into a piping bag with a small round nozzle (or a plastic sandwich bag with a tiny hole in the corner) and draw the crosses on the buns. Place in the oven and cook for 20 mins. Take out of the oven, then glaze whilst still hot (this helps to ensure the buns stay soft on top). Heat the marmalade in a small pan or very carefully in a microwave until runny. You can sieve the marmalade if you want it completely lump free. Spread the marmalade all over the tops and sides of the buns with a pastry brush. If you want to toast these hot cross buns, slice them in half and toast the inside only. The marmalade on top means the tops of the buns would burn quickly. Keep the hot cross buns in a sealed container at room temperature for 2-3 days. Alternatively you can cover and freeze them for up to 6 months. Defrost and toast before eating. 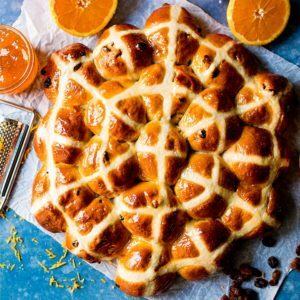 How long will homemade hot cross buns last? They're best on the day of baking, but will keep for 2-3 days in a sealed container. Swap out the raisins for cranberries, candied peel and/or chopped glace cherries. 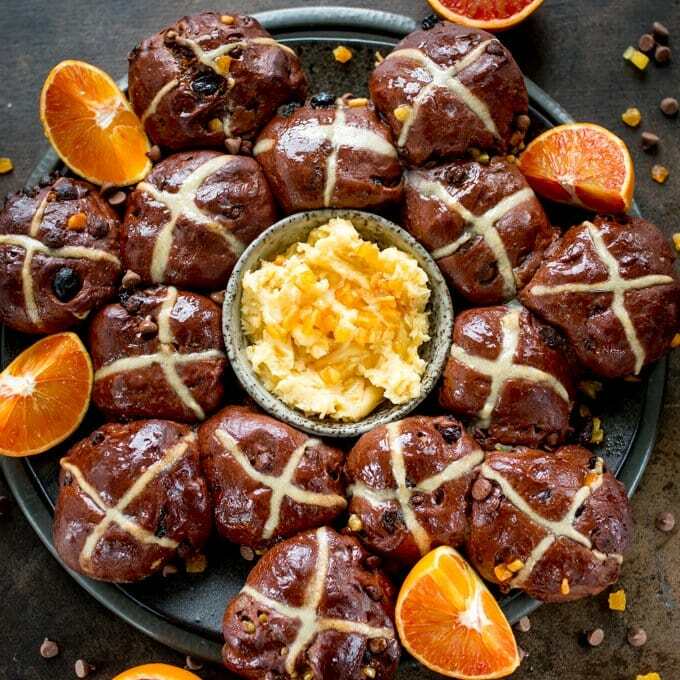 For a chocolate version, try my chocolate orange hot cross buns. 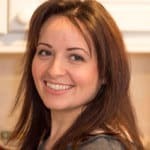 This post was first published in April 2014. 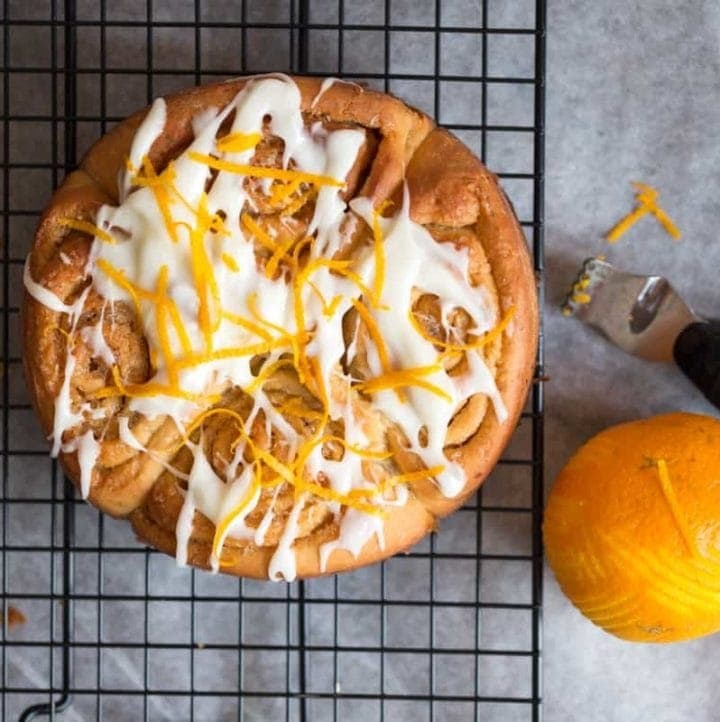 Updated in April 2019 with new photos, video and recipe tips. Home made hot cross buns are just the best. The smell coming out of the kitchen whilst these are baking is amazing. These look delicious! Added this to the Brit Mums Spring carnival.